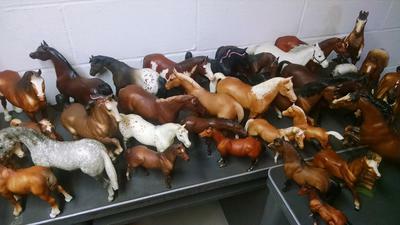 I began collecting Breyer Horses when I was a young boy and have 37 horses I'd like to sell. I have no idea what they're worth. Honestly I'd like to find someone who'd be interested in buying the entire collection but would consider selling piece by piece if necessary. I'm not interested in making a killing but at the same time I'm not going to give them away. I'm hoping I can find the right person out there who understands where I'm coming from and we can both come to a mutual agreement benefitial to us both. Try E-Bay for your sale. You can list them as a group.